Breed: "The biggest and the best terrier" - that would say thousands of Airedale owners around the world about a dog that could track down the jaguar, babysit the child, and pull the sledge.This is a truly versatile breed.? ?Hunters believe that the Airedale combines the advantages of a Spaniel, Retriever and Pointer.? ?He behaves with the same confidence on the land and in the water, in the mountains and swamps, he is easily tolerating cold and heat.? ?Airedale Terrier is able to be a guardian or a hunter, an excellent show-dog or just a pleasant companion. He has a good character - always cheerful, energetic, temperamental, smart, easy to train, Airdale Terrier loves to work and he is highly intelligent - all these qualities contribute to his widespread popularity among the dog lovers. Although Airedale Terrier is a very good fighter, he will rarely start the fight himself.? ?He is smart enough not to? ?interfere the? ?fight if no one is bothering him.? ?When forced to fight, Airdale will show the remarkable fighting qualities. England is a Homeland of the Airedale Terrier.This breed is relatively young - only a hundred years old, although the roots of the national selection goes to the more distant times.? ?Creating a breed is difficult, long and always purposeful procedure.? ?Airedale Terrier is not an exception. Long time ago in Yorkshire for hunting otters living on the River Aire people used the Otterhound. This dog? ?had some special qualities that were missing in terriers, but did not perform their passion and excitement. Hunters needed a dog with a terrier's temperament, tireless, courageous, with an excellent hearing and vision,? ?with a waterproof coat,? ?adapted to work in the water.? ?A significant role in the formation of such a targeted breed played a so-called "dog fights" and very popular in northern England competitions for dogs in catching the water rats.It is suggested that from the Otterhound and the old English Black and Tan Terrier was obtained the desired type of dogs. The rumors? ?about the wonderful dogs over time was spread beyond the region. People suggested? ?that they were obtained by crossing a set of breeds - Bull Terrier, Old English shepherd dogs, Yorkshire Terriers, Irish Terriers, and even Collies. They were called the "Working terrier" or the "Coastal terrier". The first exhibition in the valley of the River Aire, which presented the "Coastal dog", was held in 1864.? ?But only in 1886, the English Kennel Club approved the name of the breed - "Airedale Terrier" - and the first 24 dogs of this breed were introduced in the stud books. In those days Airedale - comparing to the modern standards - was looking very poor.? ?Exterior of the dog, the color, the coat quality, defects in the constitution - only very few people were interested about this things. Biggest part of the breeder's attention was dedicated to the working qualities: the new dog had to be smart, obedient, brave, and equally active on the land and in the water. But if in the north of England above all were valued the hunting qualities and the temperament of Airedale Terrier, in the south of the country - where these dogs were finally brought - breeders also gave a great importance to their appearance.? ?In 1892 the breed fanciers created the Airedale Terrier Club.? ?A young Airedale became a fashionable dog of the wealthiest in England.? ?From that time began and continues to this day a serious breeding work on the improving of the breed. General Features: The Airedale is the largest of the terriers, muscular, active, very sturdy and compact dog, with no hint of the long-legged, or excessive length of the body.Airedale Terrier is very expressive, quick in his movements. Nothing can escape from his vigilant attention. Character is manifested in his eyes and the position of his ears and tail. Confident, friendly, courageous and intelligent, constantly attentive, not aggressive but fearless.He has a wire harsh topcoat and a soft undercoat, which comes only in one color - black (sometimes dark grizzle) and tan (where tan is covering the legs and head of a dog). 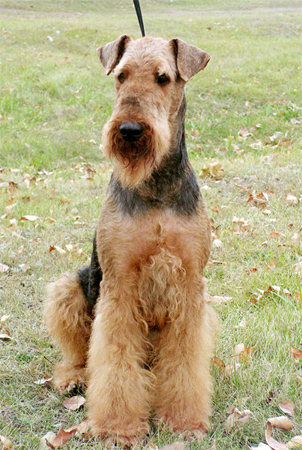 Airedale's eyes should be relatively small and dark. Ears are fold to the sides of the head. The docking of the tail is optional. 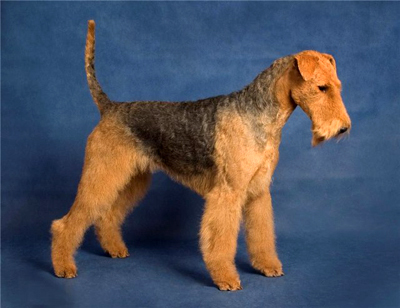 Temperament: Airedale Terrier is a magnificent dog, full of vigorous energy. He perfectly combines the qualities of a family pet and the working dog - the guard and defender.? ?Airedale is always cheerful, energetic, smart, easy to train. He loves to work.? ?Perhaps there is no other breed of dogs, who's abilities will be so different.? ?Airedale Terrier's potential is huge.? ?Ratter and hunter, guard and shepherd, the military dog, great companion and perfect play-mate for children - this is not a complete list of Airdales, showing their extraordinary abilities.? ?In addition, well-groomed Airedale Terrier is indeed extraordinarily handsome.? ?This is a great show dog and pretty often Airdales are getting "Best in Show" at the most prestigious exhibitions.But in order to confirm Airedale's reputation as the universal dog, he requires a special training, since all of these talents are not innate.? ?The man is also not born with his abilities to read or write. Everything in the world must be learned.? ?Every working dog should be gradually prepared for this or another work. Many of the qualities inherent in Airedale, remain unclaimed until they wake up.? ?Discover your dog.? ?This does not require a very big deal. It's just important, that your Airdale Terrier will not be bored with you and interested in studies. In training, consider his natural curiosity and a lively character, and then you will not have any problems.? ?Airedale is studying everything very fast. He can be trained by??? ?people of different age and level of fitness. Nowadays people rarely? ?purchase Airdale Terrier as a hunting or a guarding dog.??? ?Typically he comes to your life simply as the best friend and family member.? ?A friend of yours and your children, Airedale can lift your mood, cheer you up after a hard day, transfer to you some of his boundless energy and force to look around more optimistic. The Airdale Terrier is incredibly good natured: he loves children and you do not really need to keep him on the leash all the time, fearing that he will bite passers-by, but if it will be necessary, without any delay your dog will be on your defense.? ?Airedale is not a fighter, however, he is able to stand up for himself when it is necessary.? ?But, based on the ideas of the breed creators, a working terrier should not put up a fight with a tribe and be distracted from his work.? ?However, he must be brave and never retreat before the danger.? ?The quiet confidence and a friendly curiosity - this is the real Airdale Terrier's character. Airdale is able to become aggressive, especially if he is systematically being trained for that. But still it is not so easy to install??aggressiveness? ?as a rule. Airdales? ?usually relate to the world around them "without a stone in the bosom", they are too honest and dignified. And this is a real beauty of the Airdale Terrier - strong and brave, they are full of curiosity and good attitude. Health problems: Generally the Airedale Terrier is a very healthy breed. Still some Airedales are prone to skin allergies and eye problems. In some lines hip dysplasia may be an issue.